Last Thursday morning, ideas collided in my head from the webinar, chats, and conversations I had the day before. I ended up with a funny metaphor of Knowledge, lifelong learning and the role of L&D. I wish to share it with you. I came to this conclusion “L&D should be like air traffic controllers, not drivers”. Later the same day I answered like this to “How do/will you drive learner engagement in your initiatives” during #chat2lrn (Note: L&D today are professionals usually attached to HR taking care of Worplace Learning, Performance Support and Careers Development). I elaborate on this trail of thoughts here. Keep in mind dear reader that this Thinking Out Loud. A fresh creative idea not a manifesto. It’s a metaphoric tale based on my intuition. It’s an invite to think outside of the box. Open-minded people with like it, close-minded will be sarcastic and dispraise it as irrational, unfounded. They are true and I can take it. Let’s jump in this futuristic dream. I imagine that nowaday life-long learners are like pilots flying their aircraft around the world. They poke around places and collect knowledge. Our knowledge travel with us, always. The more we know, the bigger the aircraft becomes. Wednesday I started to pay a visit to Sohana in Mumbai at 2 PM. I attended Lisa’s nice webinar on “Learning Catalyst” in Bristol, UK at 3 PM. I had an impromptu chat with @Elsua (Spain) and @JaneBozarth (South Carolina) afterward while preparing #PKMChat later the same day. I’m free to travel the path of knowledge at anytime, anywhere provided I know where it takes place. The nearest transportation device I know in real life is a plane. 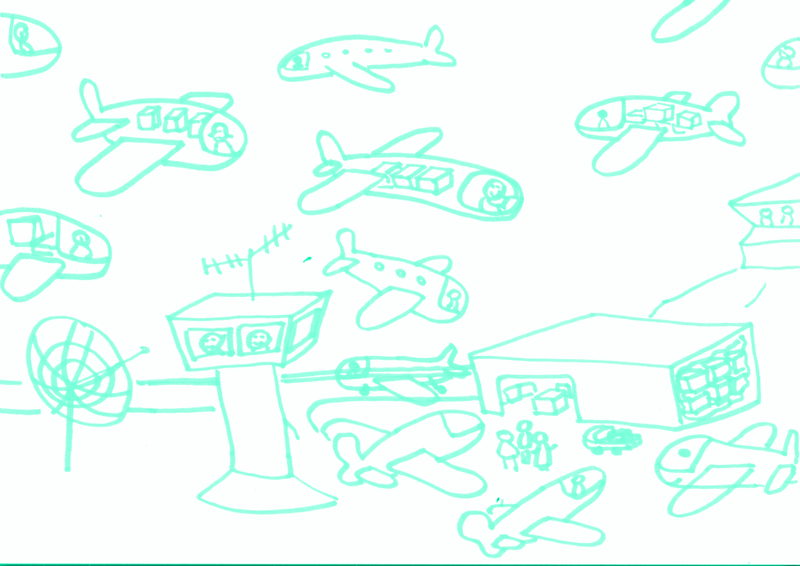 So I went on ideating using planes. Imagine each of us flying with our little aircraft and with our knowledge as payload behind us. Our knowledge is now forming a stream. It flows from the places we take off to the places we land. Let say knowledge is in corrugated boxes. Resistant and easy to move around, because we keep moving it. Whenever we share knowledge, we take one box and get out of the plane with it and give it away. The good thing with knowledge is its spontaneous generation. As soon as we take a box out, a new box appears exactly at the same place in our airplane. – Add only well-curated knowledge. – Avoid taking with us useless weight like information that could be kept on notes. – Let go or restructure as our understanding progress. There are major airports also know as hubs. These are the MOOCs (Note: MOOCs are Massive Open Online Courses, course can have up to 50000 students simultanously), the chats depending on how many boxes we collect or leave. MOOCs are hubs with huge storage attached to them. You land and roam around the huge storage (like Helen in Ikea) and hoard as much as you can carry. Check the catalog of Coursera: It’s a like a “Pinterest of Knowledge”. Little vignettes promising exciting courses. You can take as much as you want, from wherever you are. What a progress compared to 20 years ago. During our shopping, we chat with other shoppers, exchange some recommendation, ask for mounting tips. Some of us even have blogs with our realizations. Some meta-knowledge is exchanged during such interactions but most of the knowledge is formal and taken from stored boxes. Once done, we fly away again. Such airports have usually large towns next to them with universities, communities to keep an eye on the boxes, arrange them. Think of ORD (O’hare airport), DFW (Dallas/Fort Worth) or FRA (Flughafen Frankfurt). Other hubs are like DXB (Dubai), right in the desert and very convenient for transfer. There is no storage attached. Just a duty-free: the topic. The model is the waterhole. All kinds of beasts are going to join. Boxes are exchanged from travelers to travelers. We arrange temporary facilities also know as transfer halls. On Twitter, we call them Twitter chats. Social learning is running the show. From who came with his arms loaded with boxes, it’s a time to share what he knows. It’s open-minded, generous, not formalized. At this stage, dear reader, you may wonder if I stayed too long under the hot sun. Relax, sit back, defer judgment, don’t let preconceived ideas to surface and enjoy the ride. You may as well jump in the comment section and give way to your own creativity. Ready for more, let’s go. Bill: What do you have in this nice box? Bill: nice, anything I can use? Elsa: Sure! I placed in it some interesting lists to follow, a recipe to build you own, a curated list of post on the topic. Bill: Cool, may I have a look? Bill proceeds and opens the box. So what is important here is that we are adults, responsible for our lives. We can make sense of what others have to share and if it’s suited for us. It’s a negotiation not very different from buying food or discussing the menu with the waiter. We don’t need anyone to help us. If I can decide where to fly my plane, why should someone drive my learning plan? I’ll treat the objections of compliance training and the how to deal with learners who don’t enough autonomy in a separate post. Let say we focus on Agile learners first and will help everyone to become one. Now Bill and Elsa contemplate the open box. What Helen states about Ikea applies to knowledge as well: “Creativity only created once the box is opened…”. Bill starts to pick stuff from it, comment his learning on his progress blog and Elsa observe him. He took this and that. He thanks her with a nod and left. Elsa is horrified. She spent so much sweat and tears to prepare this box. She was in love with her work and placed so much hope that people will use everything. Bill didn’t notice the smart actionable list she hid behind this well written long form text. Bill didn’t take the bookmarks on kittens either. Well that the true state of Knowledge transfer. It’s pretty egocentric. We take what we want, forget everything else. This means that for each box we prepare 50% will be lost for others, from the rest of 50%: 20% will go to Bill only, 30% to Jane, 35 to Tom, 15% to Bruno etc. Numbers don’t add, there are overlapping because Knowledge share is not consumed but duplicated. The box should really be considered as a manifest, not a container. I read once on a Rickshaw: Knowledge is the only assets without depreciation. It’s plain wrong. I give you 10 rupees, how much do you get? 10 rupees. I teach you everything I know in coding, how much will you get? 20% of it. And when we leave groups or disappear, 100% depreciation takes place. Once it’s understood that knowledge lives in streams the real depreciation becomes apparent and it’s huge. It’s time knowers take the lead. If we want to be more efficient in this transfer we, lifelong Learners must acquire Knowledge Management and Learning techniques basics. Like we learn to cook from chefs. We must arrange to pick the brains of specialists and turn their knowledge into simplified recipes we can apply. Since we will not use it often and only for applying, we will retain a contextualized, pruned version of it and it will be digestible. An easy trick Lisa might have done is to stay in touch with Bill and make sure she gets his feedback as he applies her knowledge. Using Empathy Listening she could learn and use feedback. She can provide on the time of need, extra assistance to help Bill complete his first use of it. She makes her knowledge better, Bill benefits from support as he deepened his understanding. What is clear is that Knowledge Transfer as a long tail. What is apparent is when people encounter and exchange boxes but afterward, behind the scene, fertile conversations can take place, interiorization can be made observable. Recommendation via word of mouth will help the process iterate with other learners. Boxes are what we see and track but conversations are where the fine-tuning of understanding and adaptation of knowledge takes place. They start by radio from cabins to cabins before landing and last long after. Sharing knowledge is giving. Why not learning to wrap it properly like we do with other gifts? One thing we need to learn is to do proper Packaging: Select the best pieces, makes them attractive, easy to digest. Prepare the boxes to support the travel, being moved around several times. We need to learn proper labeling: How to tag and add a manifest to our knowledge. Finally, we need to advertise our boxes. Without proper advertising, it will remain unknown because not found. We need to place our boxes below the radar of the traffic controllers. You don’t hire a professional to prepare your Christmas presents, do you? In 2016, everything is DIY: Cooking, dishes washing, learning, coding. Learning design may follow the same path. Occasionally, we use the service of a professional because it’s very important, very precious or to make a difference. It’s also the occasion to learn from her how to make our future packages better. So we will favor designers who work out loud. To direct himself, our lifelong learner will need to learn how to set goals, learn the tools: how adjust his compass, his navigation instruments, and the methods: How to navigate with a map and compass. Theses skills have been made easy for car drivers with Google map and GPS. Set your destination and relax. We wouldn’t raise objections like “the majority of people will never get this skill” for driving cars or a 3 weeks workshop is needed but not tools. Driving a car is way more dangerous than learning. Taking detours and losing tracks could happen every day causing hours to be lost. What has been done? Twisting the problem, writing good apps, adding good affordance, nice maps with details and pictures. I don’t see any valid reason the same can’t be done for learning as well. Disruption, good will, and growth-mindset will prevail. Learners will have to acquire new skills like determining goals, intermediate objectives, and planning. They do it every day for their projects, their life, they can do it for learning as well. As planes are buzzing in the air bigger, more excited and faster than before, knowledge life-cycle accelerate. Half-baked knowledge will start being consumed by others. The toping will be collaborative. Trying to organize the transfer via storage where learners will not meet is accepting a heavy loss of efficiency in the transfer and losing opportunities to make it better. Trying to intermediate between knowers and learners is a lost battle like trying to stop a river. We have now the possibility to take our plane and take a view from above on the knowledge flows. 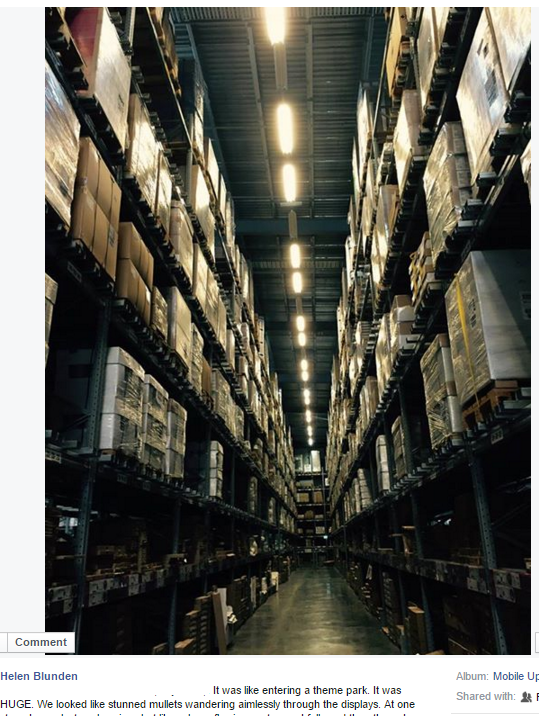 We can see behind the warehouse and track the knowledge to where it originated and go to the source directly. This is one of the great benefits of Internet: this ability to bypass intermediates and go directly to the best supplier. There are cases where the original source is no more available or this level of sharing is unintelligible for us. Intermediation, curators, and explainers are there to help. We expect them to offer this service in a transparent and authentic way, to let us free to drink directly from the tap and don’t try to influence our choice or directions. Intermediation should come with no strings attached and no “arrowing”. Who else do we have in this landscape? – When the traffic becomes dense around large airports we need coordination. – When we are unsure of our goals, we welcome guidance and external view. Those aircraft are so bulky it’s hard to see everything of ourselves. That’s where coaches help. – In the huge confusion of airline traffic, it’s good to have some people placing beacons on the best pilots and tags on their boxes. That’s what curators are doing. They do it even better if they do a learning object curation and not only a content curation. – It’s helpful to have connectors. People who can come and whisper in our ears: “Look this guy, he is doing something that could interest you”. I can even introduce you to him. That’s how I imagine Learning catalysts from what I got from Lisa’s webinar. Let’ take a closer look at this last role: The traffic controllers. They come in two kinds. In large centers, far away from airports, they give you general indications from time to time. As pilots from long hauls, we are mostly on auto-pilot mode. We may need guidance from far away, with a long long leash to remember us of our commitment, to be shown our deviation from the planned route as seen by the radars. They don’t drive you, they just give your corrective information. In the control tower. As soon as you reach a place of Knowledge exchange you will like to be helped and guided. It could be a simple standard service, totally automated like when you register for a MOOC. It could be a personalized service and guidance to preferred parking lots for easy access and shorter connection. Either one or the other it remains a choice of the pilot. he will choose to depend on his skills, his time constraints, and his objectives. I picked this quote from Lisa Minogue presentation on Performance Catalyst, slide #14 https://t.co/EDaf9IlxNc . My thesis here is that elements flow with people, follow the people to locate the knowledge. Be part of the transformation, not running behind. Some rebels don’t like to be guided at all and will arrange meetings in small remote airports will a bunch of peers. They will co-opt a one-day traffic controller using skills they learned from professional traffic controllers, or hire one for the day. Exactly like for the packaging. Lifelong learners managing their professional developments are really like independent travelers. They chose their destination and plan using multiple sources of information and word of mouth. They don’t take packaged tours. Last we have the bus drivers and the taxi drivers. Bus drivers are employed by large airlines and fly aircraft’s on most frequent routes. With the technology progress being done and the race for saving airplane tend to be bigger and bigger, onboard personal reduced to the minimum. Driving learners by loads while limiting their carry-on to 20kg dimension constrained boxes is not going to offer a lot of career opportunities. It’s even possible that a lot of supporting work will be automated. Could it be that you wonder how this relates to Kneaver, my business? Kneaver aims at empowering independent lifelong learners with the best toolset, tools even large companies don’t have. Our mission is to set you free to use all the knowledge you need to achieve your goals. In the picture, Kneaver is the dashboard of your plane. Kneaver helps you load Knowledge Packages, create others. Kneaver is more than a knowledge base: it integrates with plenty of services and social media. It’s like augmented reality in airplanes. It takes care of what is beyond your horizon or when you are away. We are also working on a KPM Knowledge Package Manager a standard for the manifest in the boxes. With a manifest, they become learning objects that can be found, exchanged and combined. It’s a common pattern in Software but unknown in L&D and KM. It’s time to disrupt both industries. Why don’t you subscribe to our newsletter? A tiny box with a delicious micro-learning nicely wrapped in silk paper, delivered to your mailbox every Wednesday. Small gifts are a nice way to stay in touch don’t you think so? Get a Micro-Learning delivered right into your mailbox every Wednesday morning. It's less than 1 minute to read. It includes 1 takeaway, 1 example, 1 exercise and 1 stretch goal. Wednesday after Wednesday you become a smarter. Subscribe below, enter your name, email and click "Subscribe". Click to subscribe! Not sure? fair enough, we don't spam, a weekly short mail, that's all. We don't sell contacts either. Why not checking a sample of those delicious knowledge bytes. Here is a sample. News report on the Air traffic controllers strikes in France, explaining their role in detail. Ongoing convos of how SMEs can share their knowledge and design courses themselves. A post on future of jobs. Jobs most likely to be automatized or replaced in the future. For those of you who remember how we imagined the year 2000 with flying saucers, my picture is not so futuristic. We never imagined we would have computers in our hands, yet it happened. Will find links for all of them.